A beautiful spring week-end simply demands a stroll along the seaside. Where to go? There is hardly any doubt. The winding road from the city beach Valkane all the way to Gortanova Cove and further to Valsaline is a must for many citizens of Pula when it comes to walking. 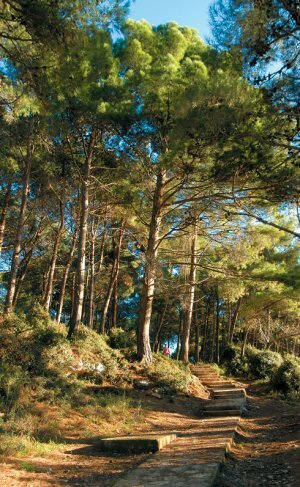 Implanted in the dense pine wood (Pinus halepensis) on the one, and the naturally rocky seaside on the other side, it offers real refreshment after a hard working week. All generations pass here daily – from small children taken out for a ride in their strollers to senior citizens, all wishing to absorb the beauty this city has to offer. One-way traffic, rather high speed bumps and curbstones provide a leisurely walk along the recently paved sidewalk. 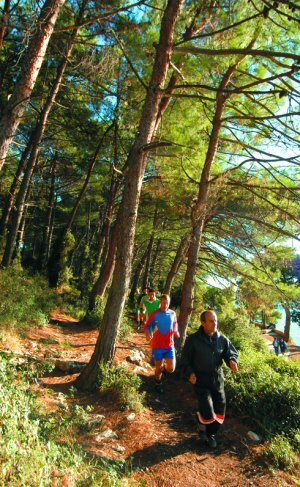 Those who are more active can take the winding paths through the woods, skipping over shrubs of mock privet, mastic tree, viburnum and struggling through tangles of smilax, honeysuckle and ivy. Since 1994 when public lighting and other urban elements were introduced (benches, waste baskets and phone booths), it is equally lively here in the evening hours when young generations meet. 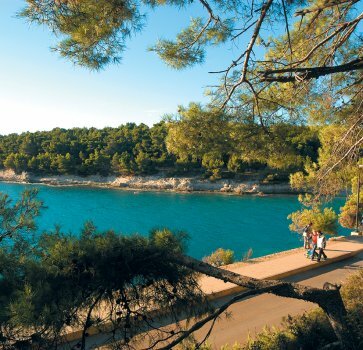 If you ever come to this charming Istrian city in spring, don’t forget to go for a walk along the wonderful rocky coast. And while the gentle mistral plays with your hair, you will feel the scent of iodine and pine in the air and your heart will be filled with enthusiasm. You will feel as if you knew all the strollers even though you have never met them before, and have the need to greet them and give them a smile. Maybe this is where the secret of the goodwill and friendly mood of its citizens lies. And the sight of the sun setting above the lightly ruffled sea horizon is a unique experience that remains in your memory until the next encounter.